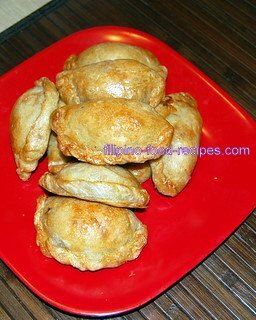 The empanada Filipino recipe is made from chicken, with different vegetables like potatoes, green peas, carrots, and raisins. The dough has a hint of sweetness to it. The process is quite tedious, you need to boil the chicken separately before sauteing it to make the filling. You need to make the pastry dough, then fill with the sauteed chicken, before frying or baking. Empanada doughs can be soft with bread-like texture, or flaky and crunchy crust. The flaky crust is made by the fat that separates the layers of the dough when cooked. It's the same dough you use to make hopia. 1 Boil the chicken breast in 2-3 cups water with 1 medium onion, then cut in cubes. 2 Saute the garlic and onion, then add the chicken and all other ingredients. Set aside to cool. 3 Mix all the dough ingredients together. In a separate container, mix the roll-in fat ingredients together. 4 Roll out the dough in 1/2 inch thick and put the roll in fat in the center. Gather the edges to seal in the roll-in fat. Rest for a few minutes. 5 Roll out the dough to flatten and fold in thirds, then set aside for a few minutes. Repeat this step twice, resting the dough after every handling. 6 Flatten the dough and roll like a jelly roll. Cut to divide in 18 - 20 pieces. 7 Roll out with the cut side up to 3 inch circle, spoon the filling in and fold the dough to make a half moon shape. 8 Crimp the edges or press the edges with the tines of a folk to seal. 9 Deep fry in oil until golden brown, or bake in a pre-heated oven at 375 ° F for 25-30 minutes. Want a short cut crust to use in your empanada Filipino recipe? Go to your supermarket's freezer section and get the Frozen Puff Pastry Dough -- just follow the label instruction. It may not be a sweet crust, but adding more raisins to the filling will do the trick. To reheat an empanada, place in a 400 °F pre-heated oven or oven toaster for 15 to 20 minutes for a nice and flaky crust.